Magnaclean is an extremely useful product that you can use to the benefit of your home and your central heating system. Fitted to the main circuit, it can help keep the efficiency and safety of your heating system to an absolute maximum. However, installing Magnaclean can be quite an issue for some people, as the instructions aren’t as clear as they could be. If you are going around in circles trying to install Magnaclean, then these simple solutions should make it perfectly possible. If you are unsure about any task that you about to undertake, then contact us Direct Gas Heating today for a professional guideline and assistance if required. Your heating systems health and safety should be of utmost importance, and the wrong kind of installation can really risk the safety of your heating system for the future. 1. Start off by draining your central heating system, or your plug-off feed and expansion tank, and let the system pressure be released. Next, measure a 110m section for a 22mm unit, and a 195mm section for a 28m unit. Make the markings that you need to follow the process as easily as possible later down the track. 2. Make sure that if you are installing your Magnaclean installation that you should try and always provide it with at least 250mm of a gap between the top of the canister and the bottom of the system itself. This makes it far easier for cleaning at a later date. 3. Using a specific form of cutter, remove the section of the pipework that you need to create the right type of opening within the system. 4. Prepare the piping and the fittings as your system will need. Next, lubricate the olives and begin to assemble the valves onto the pipe. Once attached, use your hands to tighten up the fittings. 5. Start to connect the MagnaClean canister on to the valves. Tighten the compression fittings carefully, as over-tightening the fittings can reduce efficiency almost immediately. 6. Start to loosen off the valve nuts, and insert the rubber washers that come with your MagnaClean canister. Tighten the valve nuts back to strength, making sure that you don’t tighten them up too much. 7. 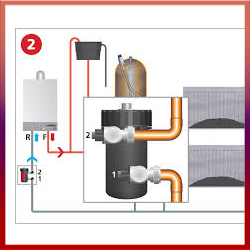 Refill your heating system once installed, and run the system while checking for any leaks or mistakes. If you do have any problems doing this yourself, you can contact us for more information on the best way to do this – or we can fit it for you. It might sound a little complex at first but you get everything you need with your Magnaclean product, anyway, so getting the fitting to go on as it should help quite effectively.